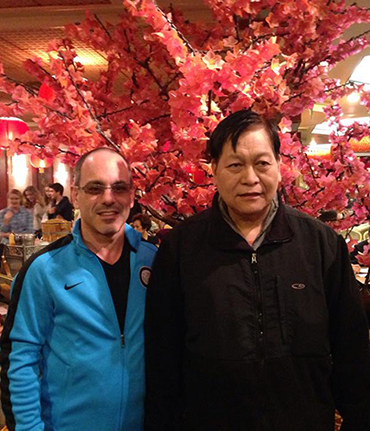 News & Updates: Sifu Birthday Celebration Sunday! Sifu Jim Roselando has been involved with internal and holistic arts for over twenty five years. He is a 6th generation disciple in the art of Pin Sun Wing Chun under Master Sifu Henry Mui, and, the only American to perform ceremony with the late Grandmaster Fung Chun. Sifu Jim Roselando is a devoted practitioner of Zhan Zhuang Qigong and specializes in what is known as Yang Sheng (life nourishing) methods. Since establishing the MIT Qigong Club, Sifu Jim Roselando has taught and trained with people from around the globe. His articles have appeared inside such publications as; MIT's Traditional Medicine Society Journal, Inside Kung Fu, Martial Arts Of China Journal, Martial Arts Illustrated, Wing Chun Today and is a columnist for Wing Chun Illustrated! Sifu Jim Roselando also assisted in the internationally sold Close Range Combat video series that were filmed in Madrid, Spain and Los Angeles, USA. Sifu Jim Roselando's Gulao Boxing Association is the headquarters for Pin Sun Wing Chun in the America. Currently, Sifu Jim Roselando is one of the few practitioners openly teaching the art of Dr. Leung Jan and the only East Coast representative of the rare internal art of Siu Lin Tao as preserved by the Cho family. Sifu Jim Roselando's Gulao DVD & Gulao eBook are the first and only items to be approved by the Fung family for sale to the public and have become true collectibles in the Wing Chun world. Sifu Jim Roselando's Qigong training popularity has exploded in recent years. With fantastic results, and minimal effort required, soon many people were hooked on his teaching style and program. Sifu Jim Roselando's Qigong is now being practiced at prestigious institutions such as M.I.T., Harvard and is the owner of Gulao Boxing Association! There is no doubt why some say Sifu Jim Roselando and his friends are starting a Internal & Holistic arts revolution. Boston, Chicago, San Diego, San Francisco, Iowa, Bermuda, Wales, Australia, Switzerland and Holland are just a few places you can find people training Sifu Jim Roselando's arts.